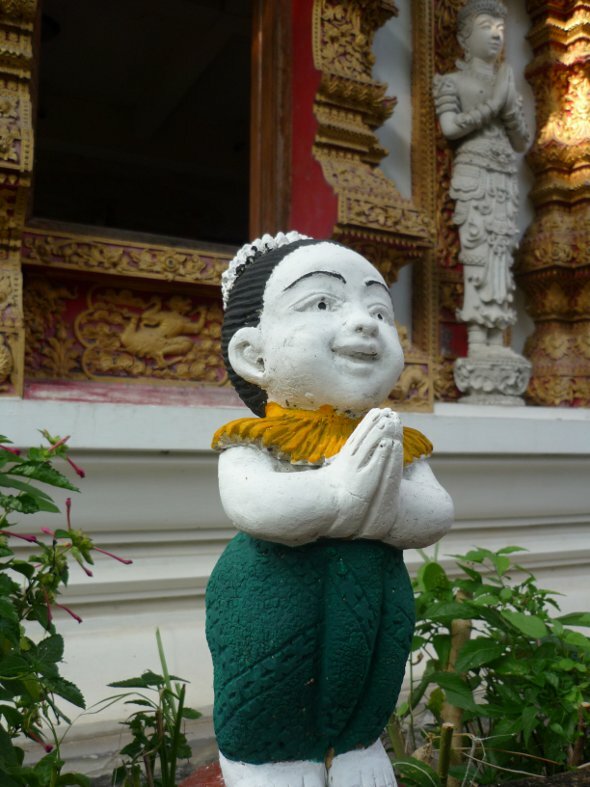 Whether they’ve been to Thailand before or not, most people will be familiar with the traditional Thai form of greeting, the wai, in which the palms are pressed together in prayer-like fashion and the head is lowered. However, what appears to be a simple gesture is in fact governed by very subtle rules of etiquette. In the title, I’ve described the wai as a greeting, but it is more than that because it is also a form of respect. The wai may be used as a greeting, but it isn’t the equivalent of saying ‘hello’ and there are times when use of the wai would be inappropriate. There are different types of wai for different situations and Thai people inherently know the correct form to use. As a foreign visitor you will not be expected to understand them all so don’t worry, but it’s important to realize that it is the social inferior who always initiates the wai. The idea of all people not being equal may rest uneasy with some visitors, but it is part of Thai culture. Monks and elderly people are at the top of the social hierarchy, but again that doesn’t mean you should wai the old lady selling fruit outside your hotel! Social superiors may or may not return a wai. Advice given in some guidebooks says that you should always return a wai. Strictly speaking that isn’t true. For example, if the waitress or cashier at the restaurant wais you for leaving a tip, it would not be appropriate to wai in return. Like it or not, in this instance you are the social superior and respect is being shown to you; a smile in return would be a more appropriate response. Similarly, the bell-boy and receptionist at your hotel are not your social equal even if you do the same job in your home country. Of course, that doesn’t mean you shouldn’t be friendly, but there’s no need to return a wai every morning. In fact, by doing so may cause them embarrassment. In many other circumstances though, you can safely return the wai, but if you’re not sure a smile will almost always get you by. On the bus or in the songthaew, some Thai people routinely wai when they pass sacred places or Buddha images. And it isn’t just the passengers; don’t be surprised if you see the driver lift both hands off the steering wheel as he passes a Buddha image or wat. Although the wai is often used as a mark of respect, it does not automatically mean all Thais will use it in deference to the overseas visitor. Thai people, particularly the younger generation, know it is not the way foreigners do things so don’t be offended if you don’t receive a wai. In some instances a handshake or a smile may be offered in place of the wai.